I attend 8-9 art shows and festivals over the course of 12 months, I often hear comments from those who come through my booth how they wish they knew more about their camera, and photography in general. I want to designate several blog posts throughout the year to offer some of my photo tips. 1. Why am I taking this photograph? 2. How to I take this photograph in a way that conveys the why? Over the next year I will dig deeper into these two questions. Sometimes photography can be overwhelming and complicated (there’s a lot I’ve yet to understand). I’m here to help overcome that. It’s ok to grow slow and take little stepping stones along the way. Tip #1: The next time you pick up your camera, or your phone, start asking yourself: why am I taking this photograph? What drew me to the scene before me that I feel compelled to document it? Why did I take this photograph? 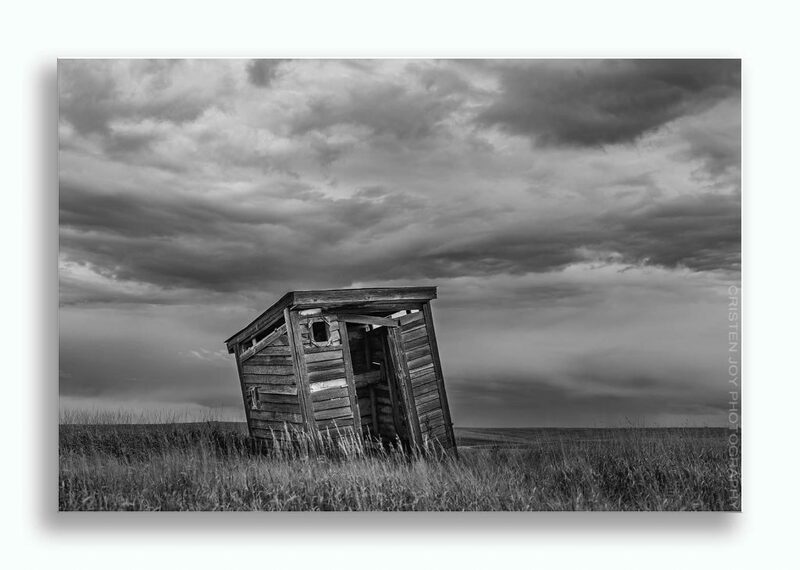 This is the outhouse Marty used until he was 8! His family lived here and their only bathroom option was the outhouse (in the early 70’s). I was with a group of pheasant hunters hiking around the area looking for birds and the sky added a dramatic backdrop (I love dramatic skies! ).